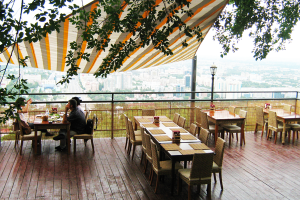 The Grill is situated at Kok Tobe, the highest point of the city of Alamty. The summit has spectacular views of the mountains and the city. The best time of day to visit The Grill is in the evening, when the sun sets behind the mountains, and the city is illuminated with coloured lights. The menu has a mixture of local and European dishes, and there is live music at the weekends. It is connected to downtown Almaty by an aerial tramway line; the city terminal is near Hotel Kazakhstan.